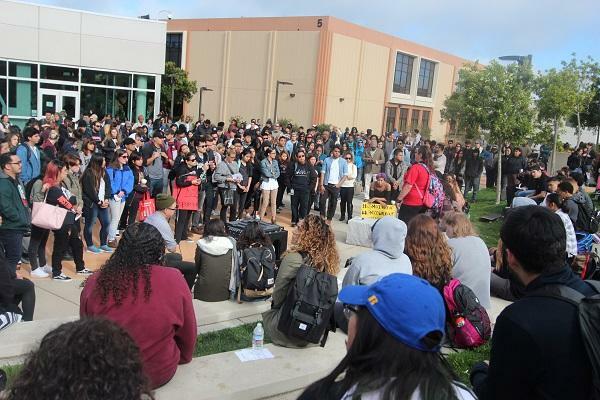 Students and faculty of Skyline College united in the quad to demonstrate a peaceful call to action from the district’s administration at 10:30 a.m. on November 21, 2016. Organizers of the walk out represented their demands to the district and also allowed anyone in the quad to voice their opinions, thoughts, or feelings about the walkout. Faculty members such as Professor Mustafa Popal, among others, were on the quad in support for the students taking part in the walkout. Even students that were unaware that this event was going to take place were respectable to the peaceful assembly. The quad was filled with students and faculty offering support to the cause.